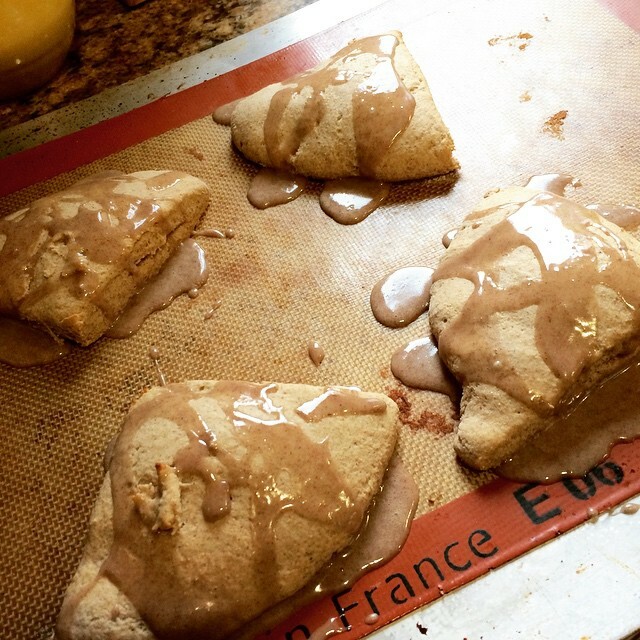 Whole Wheat Maple Cinnamon Scones - San Diego Dining Dish! I love scones. I love any breakfast sweet, really. Savory breakfast is the best to me, but I'm always enticed and sometimes won over by a particularly tempting breakfast sweet. For breakfast, I can't really think of something more satisfying than a nice, whole wheat scone made with maple and cinnamon. It just tastes right, ya know? These are quick, and the recipe makes only a few scones -- 4 large or 8 small, depending on how you want to cut them. Perfect as a breakfast sweet that won't be around to tempt you later in the day, or just enough to get you through the week if you are making them only for yourself. Preheat the oven to 425 degrees and prep a baking sheet with nonstick spray or a baking mat. In a food processor, mix together the flour, sugar, salt, baking powder, and cinnamon. Cut the butter into small squares and mix with the dry ingredients, then blitz in the processor. The mixture should look like large bread crumbs. Add the remaining scone ingredients and mix until blended, being mindful not to over mix. Place the dough onto a floured surface and knead for a minute, then shape into a small round. Using a pizza cutter, slice it into 4-8 triangles, depending upon how large you want your scones (I like big ones). Place the scones onto the baking sheet, and bake until the edges are golden, about 12 minutes. While they are baking, make the glaze. Pour the powdered sugar into a small bowl, then add the cinnamon. Whisk in the milk and maple syrup until well mixed. To make thicker, add more powdered sugar slowly, teaspoon by teaspoon, and add cinnamon judiciously. The consistency is very pourable as is, but some prefer a thicker glaze for scones. Allow the scones to cool for 10 minutes before glazing, or the glaze will soak right in!